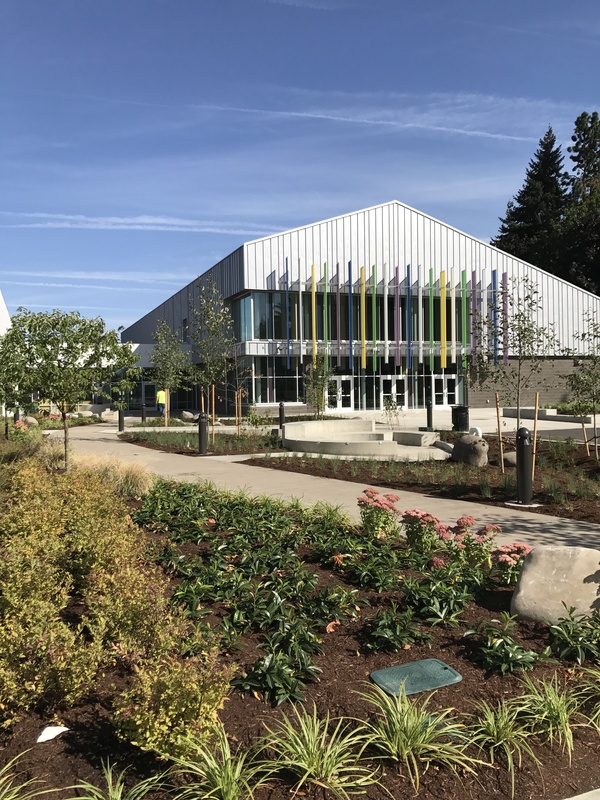 Four of Eugene School District 4J’s oldest, most inefficient school buildings have been replaced, thanks to voters’ approval of the 2013 school bond measure. 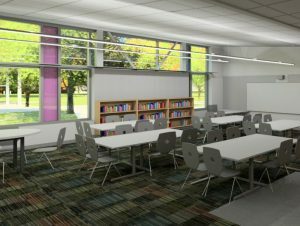 River Road/El Camino del Río Elementary School and Arts & Technology Academy were the final two of four schools to be replaced. Both opened in fall 2017. 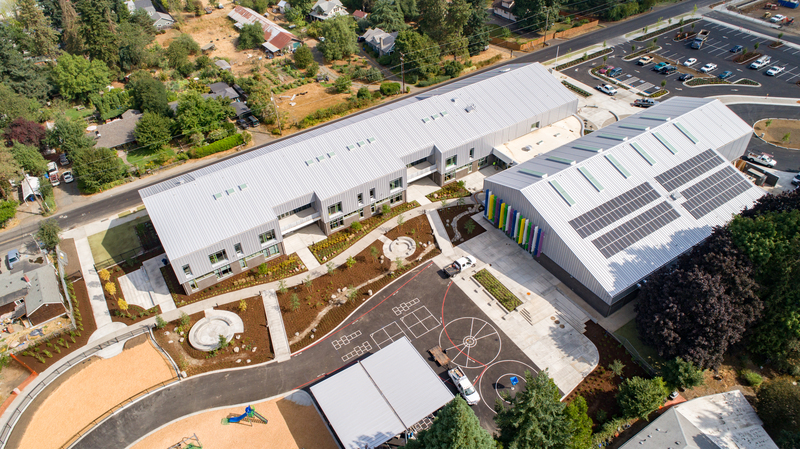 The new Roosevelt Middle School and Howard Elementary School were the first to be replaced and opened in fall 2016. River Road/El Camino del Río Elementary School, a neighborhood elementary school with a dual language immersion program, is one of the four schools that has been replaced with 2013 bond funds. The previous school building was built in 1953 and was in poor condition. The new building opened in fall 2017. The new school provides better learning environments for students and costs less to operate. The light-filled two-story structure provides ample room for classrooms and common spaces while maximizing adjacent open space for outdoor learning, play areas and athletic fields. 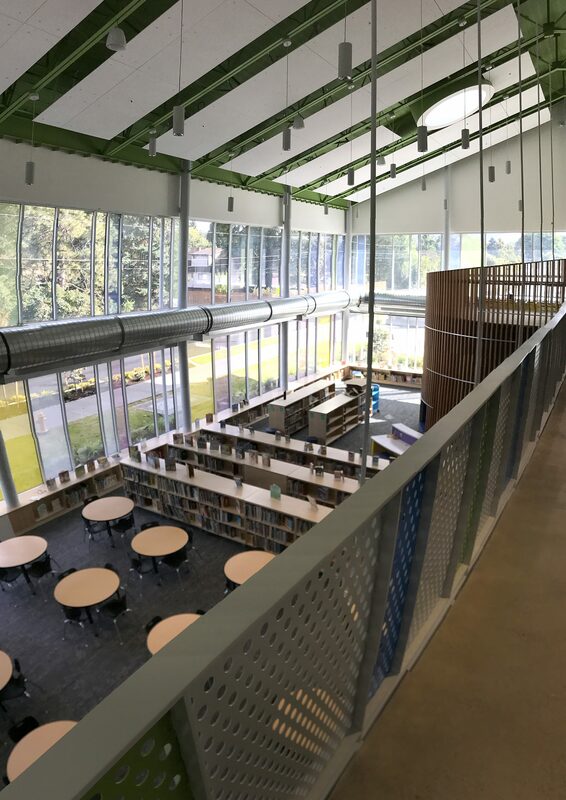 The new school building provides a 21st century learning environment for teachers and their students, who learn to speak, read, write and more in both Spanish and English. 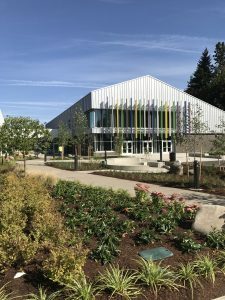 The design team, PiVOT Architecture of Eugene in association with DOWA-IBI Group of Portland, worked with a staff and community design advisory committee and sought input from students, parents, staff, neighbors and the public in developing the design of the new school. Local company Chambers Construction was awarded the construction project. • Capacity: 450 students. Designed to facilitate future expansion to 600 capacity if needed. • Building history: The new building is the fourth in the school’s history. The original River Road school was built in 1914, burned down in 1926 and was replaced with a new building, all at its original site at 1000 River Road. River Road School District merged into the Eugene School District in 1945. [Source: http://www.hp-nw.com/river_road.htm] The third school building opened in 1953 near the previous building. Site preparation was mostly completed in summer 2015, major construction began in spring 2016, and the new school building opened in fall 2017.